This month I’m going to talk about skating equipment again. Below is an interesting article by Mr. Edge that I read in Skating Magazine about whether to buy new or used skates. I think the article covers the subject well. I always recommend new unless you can find a good used pair that has decent support left in the boots and enough edge left on the blades. eBay is often the best place to look for used equipment, but it’s hard to know if you found a good fit because you can’t try the skates on before you purchase them online. New or used? This is the question many people often ask. Depending on the condition of the skate, even used skates can cost several hundred dollars. When looking for a used pair of skates be cautious in your assessment of them and do not jump at the opportunity to buy just anything. Consider the following: Read more at Ask Mr. Edge. Congratulations on buying your first pair of skates! My favorite skate brand is Jackson for most feet. If you have a really narrow foot, Riedells may fit better. If your feet are still growing and you’re just starting out, I recommend going with a Jackson Artiste skate. They’re fairly comfortable and come with a blade included. The price is usually $130 but is a bit cheaper for small sizes. For very narrow feet, go with the Riedell 17/117 Red Ribbon Skate for $115. 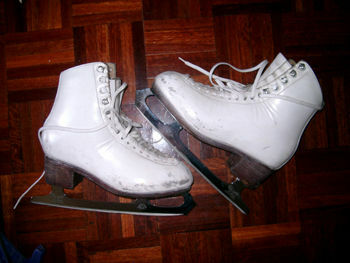 Both these skates will take you up through the Freestyle (FS) 1 to 2 levels. If you’re at FS 1 or 2, your feet have stopped growing, or you are already close to the Freestyle level classes, I recommend starting with Jackson Freestyle skates. These boots are heat moldable to your foot, making them a more exact fit. Blades come with the skates. Also, these boots are stiffer and have better blades so they will last longer than the Artiste, usually up though FS 5 to 6. Depending on size, they range from $225 to 250 for females and are $270 for males. For very narrow feet, go with the Riedell 133TS skate for $160. These boots are similar to the Jackson Freestyle skate but can only be partially heat molded to your foot. Keep the laces tight around the bottom part of your foot to keep your foot from slipping. Then, keep the ankle hooks lose enough to stick two fingers between your ankle and the front (the tongue) of your boot. This improves knee bend and helps prevent injuries. Also, don’t wrap your laces around your skates because it can cause them to wear out faster. Shorter laces (get mixed blend) are a cheap and easy solution. 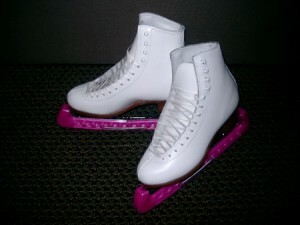 Although lacing figure skates might seem to be a natural skill for anyone who knows how to tie shoes, there are important steps to follow in order to experience the greatest enjoyment and success from the sport of figure skating. Jo Ann Schneider Farris is a Colorado Springs skating coach and writer for About.com: Figure Skating. 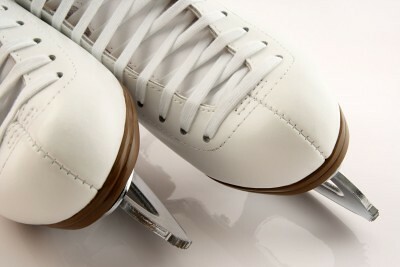 She has a clear and easy-to-follow article on the important skill of lacing figure skates.